High-quality, affordable child care and preschool is essential for many families and their children. Child care and preschool programs help children to learn and explore, while allowing parents to find and keep jobs knowing their children are in good hands. The Budget Center examines state funding and related policies for child care and early education, including opportunities to broaden low- and middle-income families’ access to quality programs. 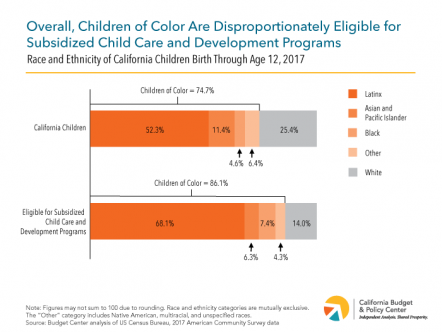 This Fact Sheet shows eligibility for subsidized child care in California by race and ethnicity. This analysis highlights the fact that children of color are more likely to live in families with low incomes and are therefore disproportionately eligible for subsidized child care and development programs. This Fact Sheet shows that the cost of child care in California is prohibitively high for families with children of all ages and that across all age groups, only a small share of eligible children are enrolled in a subsidized child care program. This Fact Sheet highlights the unmet need for subsidized child care in California, showing that an estimated 2 million children were eligible for care in 2017 but only 228,100 were able to participate in a subsidized full-day, full-year program.